UPDATE (11:53 AM EDT): The death toll is now 58 with more than 500 people injured. UPDATE (10:00 AM EDT - Katie): The sun is up in Las Vegas and we can see where the killer show through two hotel windows. UPDATE (9:35 AM EDT - Katie): The local Sheriff's department has updated the number of people injured to at least 400. Most people with injuries were transported to local hospitals by volunteers driving personal vehicles and some went by ambulance. The suspect killed himself upon arrival of police. There were 22,000 people in attendance at the concert when a 64-year-old man reigned down bullets on the crowd from the 32nd floor of the nearby Mandalay Bay hotel. President Trump has been briefed on the situation and will make a statement at 10:30 EDT from the White House. UPDATE (7:10 AM EDT): The death toll has risen to 50 and this is the deadliest mass shooting in United States history. The suspect has been identified as Stephen Paddock of Las Vegas. BREAKING: Nevada sheriff: We have located the female person of interest in the deadly shooting at a Las Vegas outdoor concert. UPDATE (4:40 AM EDT): The Las Vegas Police Department believes that the only suspect in the shooting is dead, and they are seeking to locate the "companion" of the shooter, a woman identified as Mari Lou Danley. The suspect has been identified only as a "local resident" and police are not yet releasing his name. Danley is the roommate of the suspect. BREAKING: Las Vegas sheriff: We are searching for Mari Lou Danley as a person of interest; is an Asian female, approx. 4’11, 111 lbs. There are "well in the excess of 100 injured," and at least 20 people dead, the Las Vegas Sheriff Joe Lombardo said at a press conference. Exact numbers are not yet available. Lombardo clarified that they do not believe there was multiple shooters and reiterated that the only suspect is dead. 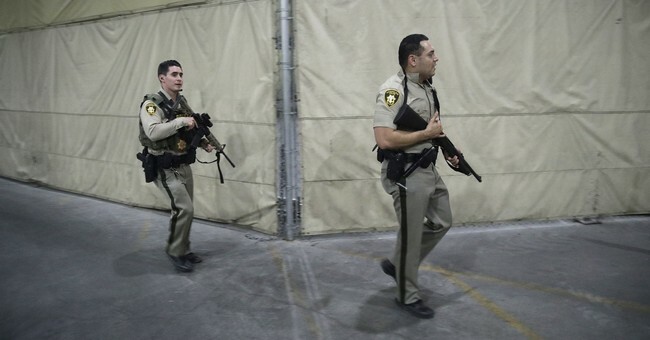 The shooting took place from the 32nd floor of the Mandalay Bay hotel. Anyone with video is being urged to come forward. UPDATE (4:30 AM EDT): Singer Jason Aldean posted on his Instagram account that the night has been "beyond horrific" and said that he was praying for the victims of the attack. He confirmed that he and his crew are all safe. UPDATE (4:00 AM EDT): McCarran Airport in Las Vegas has partially reopened. Country singer Jason Aldean, who was performing during the attack, is safe, along with his team. The shooting may have occurred from a hotel room, but this is not confirmed. (See Update) The suspect was found dead in a hotel room on one of the upper floors of the hotel. UPDATE (3:35 AM EDT): Police say that they are not looking for any additional shooters. A press briefing at 12:45 AM PDT will have additional information. UPDATE (3:30 AM EDT): Police have again confirmed that one suspect is "down," but did not confirm the presence of an additional suspect. People are being urged to avoid the Las Vegas Strip. ABC interviewed one of the people at the concert, who said that initially people thought the gunshots were fireworks. At least two people are dead and dozens more are injured following a mass shooting at a country music festival at Mandalay Bay Resort and Casino in Las Vegas. At least one of the two shooters (See update) is confirmed "down" by the Las Vegas Police Department. The shooting occurred during the final night of the Route 91 Harvest Festival and began shortly after 11:30 p.m. 10:38 p.m. local time. BREAKING: Las Vegas hospital says at least 2 dead, 24 injured, 12 critical after shooting at music festival. BREAKING: Las Vegas police say one suspect is 'down' after shooting at country music festival. Videos from the scene taken by people attending the concert caught the beginning of the attack. (Warning: the following videos contain audio of gunfire and may be upsetting.) The audio sounds like a fully-automatic weapon, but this is unconfirmed.